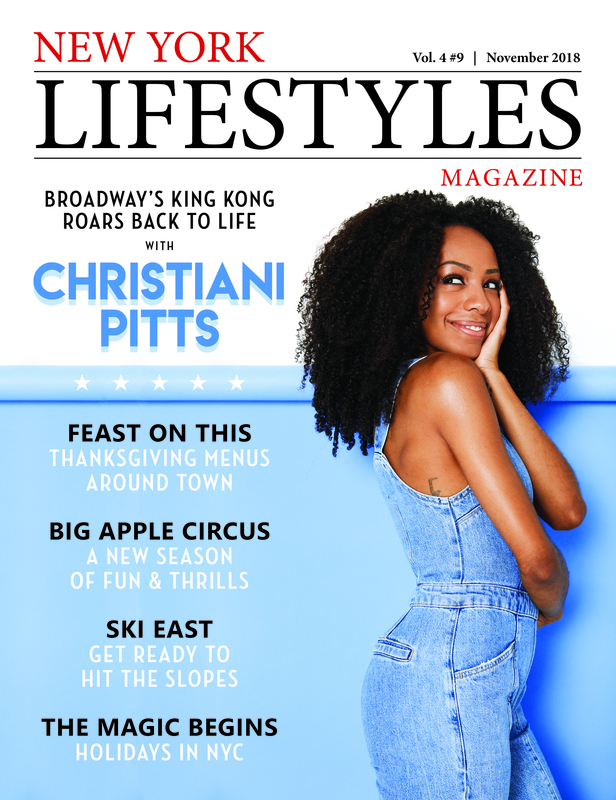 The 20-foot, 2,000-pound silverback is no match for Christiani Pitts, the beautiful young actress making a big leap to stardom playing the coveted female lead, Ann Darrow, in the Broadway mega-musical King Kong. 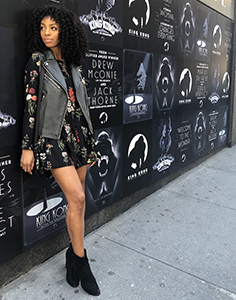 Christiani was a virtual force of nature after she worked her way up in her first Broadway show from ensemble to co-star as Jane, the gal from the other side of the Italian-dominated neighborhood along Belmont Avenue in A Bronx Tale, the musical adaptation by Alan Menken and Glenn Slater of Chazz Palminteri’s solo play and film. Now, she’s standing tall as Ann Darrow. The role made famous onscreen by the never-forgotten Fay Wray in a huge cast of 50 actors and puppeteers. 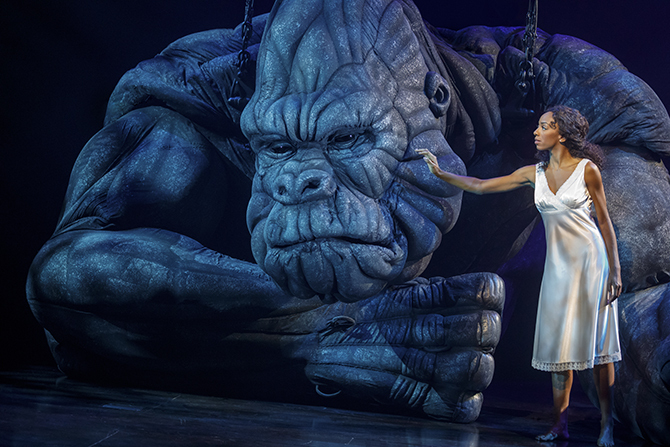 Christiani’s opening number in King Kong is the rousing “Queen of New York,” and it appears she may be on her way to becoming just that. 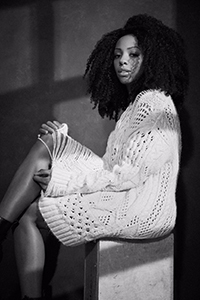 The role of Ann Darrow has been much expanded to showcase Christiani’s strengths. For instance, when the shifty film producer, Carl Denham—played by Eric William Morris (Coram Boy, Mamma Mia! )—tries to tame the untamable in a film with a Skid Row budget and decides to introduce him to Broadway, Christiani/Ann stomps on his megalomaniacal ego to do battle royal. She attempts to stop him from the destructive path he’s on. She’s not there just to do a blood-curdling scream. 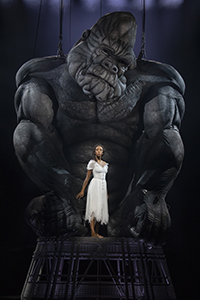 King Kong, the musical, is adapted by Jack Thorne, the Olivier - and Tony-winning playwright behind Harry Potter and The Cursed Child. Music is by Grammy-winner Marius de Vries (music director for La La Land and the upcoming Moulin Rouge) and Australia’s Eddie Perfect (the soon-to-be stage adaptation of Beetlejuice). Directing is Brit Drew McOnie (Olivier-winner for In the Heights), who’s also responsible for the show’s dizzying choreography. David Caddick (The Phantom of the Opera) is the music director. The mammoth animatronic Kong, designed by Sonny Tildlers and Roger Kirk and movement-directed by Gavin Robins, is created by Global Creatures. 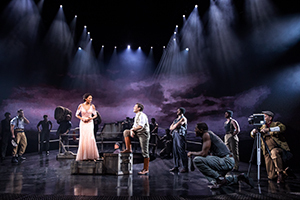 The 90’ x 27’ LED screen, Broadway’s biggest, takes audiences on a realistic journey to the New York of the 1930s and on rolling seas to mysterious, uncharted, and aptly-named Skull Island.